What’s Your Game have published some great games in the past (like Vinhos and one of my favourite worker placement games Vasco de Gama). After releasing no new games last year, it’s great to see they have two this year. 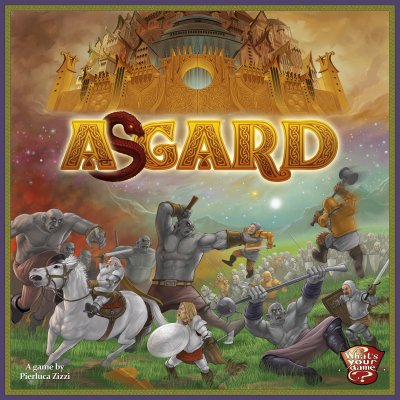 Asgard is a viking-themed, worker placement game where players place workers (influence) on different locations (gods) but there’s a lot more to it too and sounds like a meaty eurogame. The board shows the 10 gods (5 light and 5 dark), the various worlds, Asgard and Valhalla. The worker placement aspect is a bit different to most worker placement games as players first secretly select on which gods they will place each of their workers (by selecting god cards equal to the number of workers) then they take turns revealing one of their card and placing a worker on one of the available actions of that god (or placing it in Asgard instead if they prefer which has its own benefits), and then they take turns activating one of their workers. (It reminds me a bit of Era of Inventions (a great game from 2011) where players take turns placing their workers and then take turns activating them and the order of activation made a big difference too – but Asgard goes a step or two further.) It sounds like there will be lots of decision-making required as you consider where others will likely place their workers (as there are limited spaces on each god), which actions will work well together, which actions you will need to do before another player, etc. Players will gain and spend workers during the game too so they will need to manage these. Plus, the first worker used on each god earns a light/dark token which are used to buy warriors/giants and new workers (which can trigger battles).